Ready to dive in and start using Project Web App? First, let’s take a look at what you see when you sign in, so you know which areas do what. 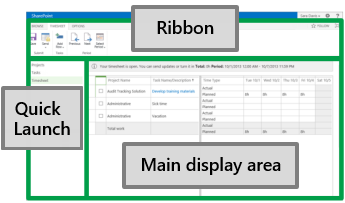 The Project Web App window is made up of three main areas: the Quick Launch, the ribbon, and the main display area. The Quick Launch lists the main views and pages that you are able to access. You can click these links to go to different areas of Project Web App. Some pages in Project Web App do not include the Quick Launch. For example, when you fill out a form, you need to complete and save the form, or cancel out of it, in order to see the Quick Launch. The ribbon is the toolbar that you use to perform actions on what’s currently in the main display area. There may be multiple tabs on the ribbon, like Browse, to move between different sets of actions. Each tab contains groups of related buttons like Submit that you can use to work with the page content. The main display area contains information about your projects and tasks. This is the main focus of each page, and is where you will enter and review data. 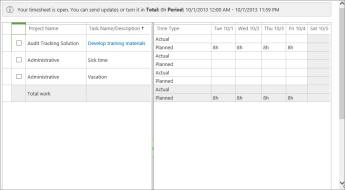 This screenshot shows a timesheet in the main display area. Other pages, like the Project Center or the Tasks view, appear here too. You’ve got the basics of how to get around in Project Web App. Just want to see a list of projects? Next, learn about Step 2: Turn in a timesheet.